Suzan fell in love with clay in her early teens in Turkey, but didn't have the chance to get her hands dirty until after she came to London and enrolled to a part time course in 2004. After finishing her BTEC certification classes in Kensington and Chelsea college Suzan practiced her pottery in a studio share in Kilburn . In 2017 Suzan finally opened her own studio in Plaistow where she designs and creates all of her work which is inspired from her mixed family background, and travels. 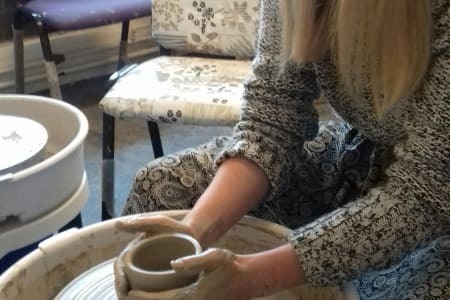 I'd never worked with a pottery wheel before, and this was an excellent workshop for a complete beginner - easy-going, comfortable and reassuring. Suzan is a lovely, encouraging teacher who gave me enough step-by-step guidance to make a confident start, but also allowed plenty of scope to explore and just play around with a new material. Firing and glazing a finished piece (to be collected later) was included in the price, but she was happy to fire and glaze two more pieces I produced for a nominal cost contribution, so I ended up with three proper, handmade bowls I am really happy to have and use! The venue was easy to reach, just a short walk from Upton Park tube. Suzan was great. I did a hand building class where we made some gorgeous bowls. Great fun and great tutoring from Suzan. I enjoyed all the classes Suzan taught very much. Suzan is a very patient and supportive teacher. She is very skilled and creative. I learnt a lot and was able to make some lovely things to take home. Excellent atmosphere and teacher. I learnt a lot in a very brief space of time. I had a great time with Suzan yesterday. She was very welcoming, gave a good demonstration and then let me get started. Suzan was on hand to remind me of each step and to guide me in the process. And there was no skimping on the clay available. I was thrilled with the results and will do more. We learnt the basics of throwing pots, and the fundamentals of a using the potters wheel. Suzan was a lovely teacher, and she gave us an amazing introduction to pottery. My husband gifted me the experience as a birthday present, and I couldn’t have imagined a better way to spend my birthday! Suzan first demonstrated the basics to us, and then let us experiment independently. She let us explore the technique and offered help and guidance throughout. We will definitely go back to Suzan for more classes when our schedules allow. Thanks a lot, Suzan! And so glad to come across your studio on Obby! It was amazing! Suzan is great! She explained everything we needed to know, making it fun and very instructive. 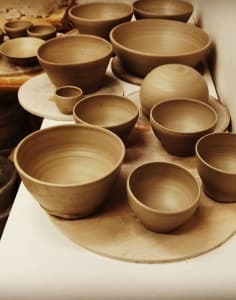 We had never tried pottery and managed to make several bowls! Very recommended! A truly wonderful class! Thank you Suzan for the most fun and productive 2 hours. Suzan takes her time with each student and makes it such a relaxed and enriching learning experience, where we were encouraged to be creative and we had multiple goes on the wheel. My friend and I left feeling so happy with the experience and with our pottery creations! What an amazing session! Susan was a great teacher, showing me exactly what to do and giving me plenty of time to enjoy it and have a play. I'm very excited about picking up my finished peices soon! Suzan is a fantastic teacher and makes her classes really fun and sociable. I was so pleased with what I made and she supported the whole process amazingly. Thoroughly enjoyed the Beginners Throwing Pottery weekend class with Suzan.. Suzan's knowledge/ experience and teaching methods ensure a relaxed and very enjoyable learning experience.. Learnt loads.. Thank you Suzan..